LMK what ya got. mainly looking for Autos, 1/1's, low numbered parallels, or multicolor patches. Please nothing numbered above /50 on parallels and no regular GU's. anyone? come on, you gotta have something! 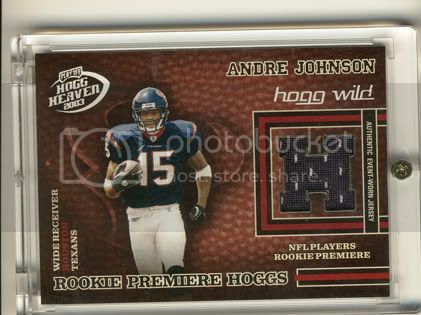 I have 2 printing plates and a 2008 LCM mirror black 1/1 of andre johnson. Do you have any Raiders or Niners that meet the same requirement -Autos, 1/1's, low numbered parallels #d 50 or less, or multicolor patches- for trade? i'll check for other items as well. do you have AJ's? how low numbered are they? have scans? what do you need for that AJ? 2007 Gridiron Gear 3 color patch #/50. Make me an offer. selling or trading? if trading who are you looking for? if selling, I'll PM you an offer. Thanks. If trading, I am looking for Eric Dickerson as a Colt, or any Purdue QB in his college uniform. Otherwise, I can sell it.